Libraries are confronted with the demand to counter the uneven distribution of opportunities for participation. But merely talking about diversity and inclusion will not be enough, according to design principal Traci Engel Lesneski. Mrs. Engel Lesneski, many worry about the future of libraries, fearing that libraries, in their classical shape and form, are rendered obsolete by digitalization. Does the library have a future? Libraries have always been about supporting literacy and learning. There are many types of literacy, and people learn in myriad ways. The 21st century library engages in all aspects of literacy and learning, helping people practice the literacies that allow them to thrive. This role points to a rich future for libraries. Diversity, equality and inclusion are core values of the library system ... at least in theory. From your observation – and in general terms – , what is the situation in practice? To which extent are these goals actually being met? I.e. what are the most pertinent challenges you see in terms of inclusion? Many professions (including the library profession) have great intentions, but still have some work ahead to move beyond talking about creating diversity to creating equitable and inclusive professions and organizations. Some of the challenge, at least in the US, relates to unequitable social, political, cultural, and organizational structures that are so ingrained we scarcely think about them, much less address them. Part of the challenge is to create a shared definition of diversity, equity, and inclusion, and importantly a shared vision for the value that inclusion brings to the profession. With libraries, the payoff for creating an inclusive profession is exponential since libraries (and librarians) touch such a wide range of people. Which role does the built environment, the library as a physical space, play in this context? Every person is different. We have varying physical abilities. We use our senses differently. We come from different economic backgrounds and cultures. We are different genders and ages. Yet much of the built environment is designed as though we all have the same needs. Shapers of the built environment (e.g., design professionals, owners, project leaders, and policy makers) affect people’s ability to feel welcome and effectively use buildings and sites with every decision made. Often, designs come about with only cursory attention paid to diverse perspectives, which inevitably means those designs leave someone behind. In libraries, which serve diverse users with a mission for building literacy and community, it is critical to consider the decisions we make that unintentionally create places that exclude certain parts of a community from using them. The 21st-century library is a place for people, designed to enhance well-being. Majestic, imposing, refined – when we think of what constitutes a „nice library“ we often think of awe-inspiring cathedrals of the mind, such as Bibliotheque Nationale de France in Paris, the library of congress, the British Museum Reading Room, or New York Public Library? Places that celebrated intellectual achievements of mankind, but are also awe-inspiring – and, in being so, not necessarily what one would consider „low-threshold“... How does the library of the future look like? The design quality and prominence of each of the buildings you referenced convey the “place” the library held for those communities when they were built. They convey a sense of meaning and import. What this meaning and import look like in 21st-century library architecture has some similarities—design quality, longevity, cultural significance—and also some differences. Instead of engendering awe to create formal places of scholarship, the 21stcentury library is designed to serve the entire community and invite inquiry and discovery. The 21st-century library is designed to support myriad activities and needs by providing spaces for individual, focused work as well as collaborative, active work, and everything in between. The 21st-century library is a place for people, designed to enhance well-being. What does it take to design an inclusive library? Where do you come in as a consultant? The health of any ecosystem relies on biodiversity. Likewise, the health of a community, and of a library as a reflection of its community, depends on its capacity for diversity. Libraries serve a wide variety of people. As facilities housing inclusive organizations, they should be designed to support as broad a cross-section of people as possible. People experience buildings differently, depending on their own cultural, social, economic, and physical circumstances, yet many buildings are designed to accommodate a narrow slice of the human population. In some cases, inequity is being constructed into the built environment. Foundational to creating inclusive buildings is the design process itself. No one person can embody all perspectives. Creating an inclusive building requires an inclusive process. Implicit biases must be overcome through open dialogue. During the programming and design phases, methods of Page 3 of 3 outreach, stakeholder input, and communication must be carefully considered to ensure that as broad a cross-section as possible has a voice. Each of us has equal right to shape the environments we experience to support working and learning, and libraries should accommodate this customization. One thing is to plan a library anew – or completely renovate it. What are small interventions, that can lead the way to a more inclusive space? Simple mindfulness when considering the built environment can make the difference between places that support inclusion - e.g., diverse heights, ages, genders, mobilities, and cultures and differences in reliance on our senses - and ones that do not welcome all users. Most of the traits that create inclusive buildings improve buildings for everyone. Each of us has equal right to shape the environments we experience to support working and learning, and libraries should accommodate this customization. The most successful building designs accommodate the greatest diversity by providing choice and the ability to customize one’s environment based on need. This approach can be accomplished in minor updates or even through furnishings design, such as through providing variety of seating options, using sit-to-stand tables for staff and patrons, task lighting the user can elect to use. Offering a small, private room that supports a variety of needs - e.g., a calming space for a child with sensory sensitivities, a prayer space, or a wellness space for someone with a chronic illness - goes a long way toward creating inclusive public spaces. The classic example today is single occupant toilet rooms, which work better for non-binary genders, people with mobility issues who need assistance from a caregiver, or parents with small children. Traci Engel Lesneski | Photo (detail): Traci Engel Lesneski Principal of US-based architectural firm MSR, Traci focuses on design for libraries and learning. She promotes an integrated design approach—equally valuing well-being, productivity, aesthetics, and delight. 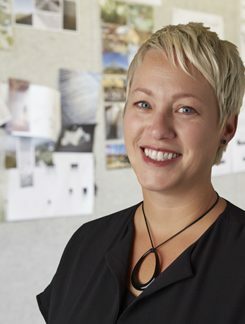 Recent projects led by Traci include a visual culture, arts, and media hub for Haverford College in Pennsylvania and the renovation of the Tulsa Central Library (Oklahoma). Traci regularly presents at library conferences such as IFLA, ALA, and NEXT Library . Traci is secretary of IFLA's Library Buildings and Equipment Section, chair of American Library Association’s Architecture for Public Libraries Committee, and was recently named to ALA’s Sustainability Task Force.